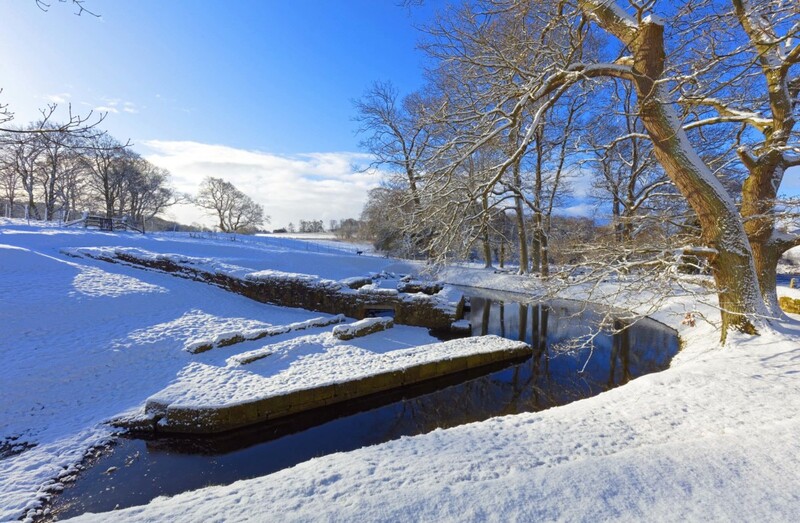 The remains of the bridge at Chesters Roman Fort that took Hadrian’s Wall across the River North Tyne in Northumberland on a bitterly cold winter morning. 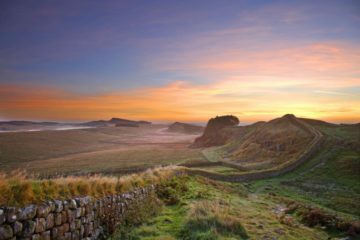 Looking from Cuddy's Crags east to Housesteads Crags on Hadrian's Wall in Northumberland on a clear spring morning. Broomlee Lough and Sewingshields Crags are in the distance. 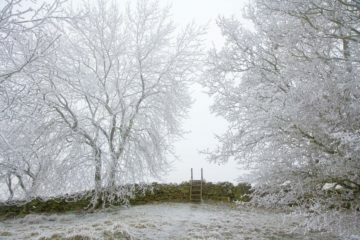 Sycamore Gap on Hadrian's Wall in Northumberland late on an early winter afternoon. 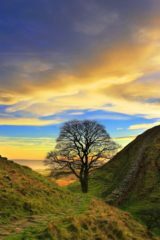 This tree is so frequently photographed that it is important to find a different view. 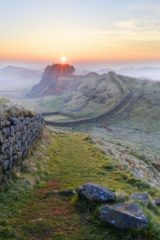 Cuddy's Crags on Hadrian's Wall in Northumberland looking east to Housesteads Crags into the hazy early spring sunrise. Sewingshields Crags can be seen in the distance. 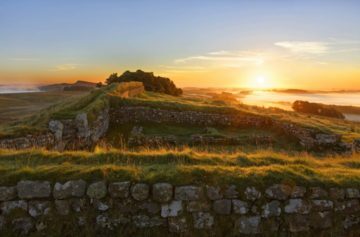 Looking from Cuddy's Crags to Housesteads Crags on Hadrian's Wall in Northumberland is one of the iconic views of the Roman Wall. On this early spring morning low lying mist lay in the hollow. 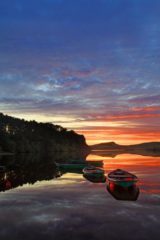 A dramatic and colourful October sky over Crag Lough under Highshield Crags on Hadrian's Wall in Northumberland. Winshield Crags can be seen in the distance. 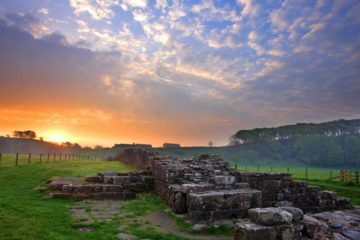 Spring sunset at the Mithraic Temple at Brocolitia on Hadrian's Wall in Northumberland. Originally this was the site of three temples. 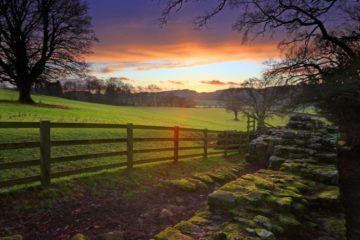 Willowford Bridge on Hadrian's Wall in Gilsland, Cumbria, is the site of the Roman bridge over the River Irthing. The remains are now some distance from the river that has eroded the bend on a steep bank. Milecastle 37 on Hadrian's Wall in Northumberland on a bright spring morning. This picture clearly shows the partition walls within the Milecastle. In the distance is Sewingshields Crags. St Oswald's Church at Heavenfield on the Hadrian's Wall Path in Northumberland is an ideal place to rest weary feet. The Church is delightful with magnificent views to the north. 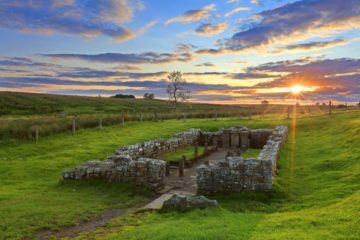 The Brunton Turret on Hadrian's Wall in Northumberland is close to the River North Tyne. 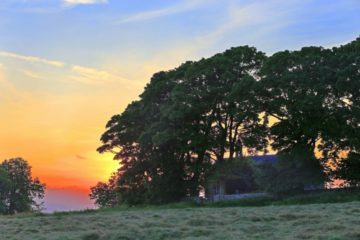 It is at the top of a field normally inhabited by sheep. It is worth the time to visit it. 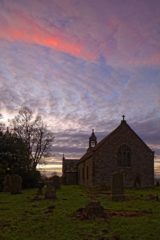 An extraordinary late autumn sunset at St Oswald's Church at Heavenfield in Northumberland on the Hadrian's Wall Trail. This was one stage of a spectacular display constantly morphing into other equally spectacular displays. 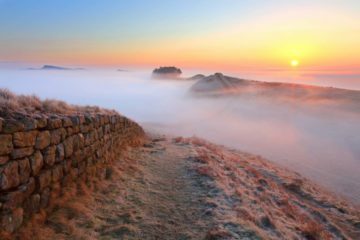 Close to Milecastle 24 on Hadrian's Wall in Northumberland on a misty, frosty afternoon. This is the highest point on the Eastern section of the Roman Wall.